Step 1: Click here to download and install the video converter. Step 3: Add AVI file (click icon in the top left corner or use the “Browse” button) into AVS Video Converter as shown in the picture below. Note: In this tutorial the input file (AVI) name is called “FileName”. Step 4: Select the output format by clicking the large rectangular “To DVD” thumbnail that is located along the top of the software interface. Step 5: Select Output File Name by clicking on the “Browse” button on the right hand side of the screen. Manually type a suitable file name for the output file. This is shown in the picture below. Note: In this tutorial I have called the output DVD folder “NewDVD”. Step 7 (Optional): You may need to configure the “Advanced” settings for your specific application. The aspect ratio of your DVD file may be changed here. In my example I left everything as default. Shown in picture 4 below is the Advanced Settings Panel. You now may convert your video from AVI to DVD. The length of time this takes depends on the file size and selected bit rate. You can monitor your conversion progress via the progress bar at the bottom of the software interface. My 30MB AVI file took less than a minute to convert. You can monitor your conversion progress via the progress bar at the bottom of the software interface. You may need to pause during the conversion. You can do this using the “Pause” button. You can also choose what the software does when the conversion finishes e.g. play a sound or just do nothing. What I found very useful was the option to have the software shut down my computer when the conversion finishes. You may require to run several AVI to DVD conversions simultaneously. To achieve this just keep adding files like you added the first one. Don’t worry about the order you add them if you want to prioritise the order at which the conversions run. You can do this afterwards using the arrows at the right hand side of the software interface. 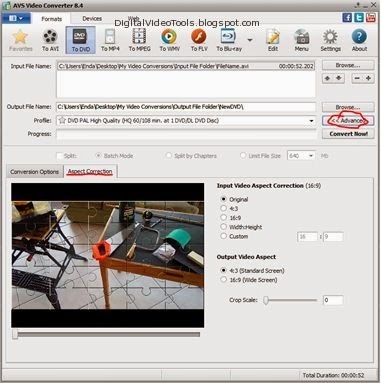 Another amazing feature of the AVS video converter is the ability to create chapters for your DVD and also a chapter menu so that you can navigate through the chapters via your DVD player. I am not going to go into the details of how to exactly do this here but if you are interested in doing this watch the video here or read my written tutorial here. As soon as the file conversion is complete you will have the option to burn your DVD files to disk. This dialogue box is shown in the picture below. Shown in the picture below is the burn disc options menu. It is here you select the disk drive your blank DVD disk is contained. Also you can give your disk a name e.g. Holiday Footage and also the disk writing speed. The default settings resulted in a DVD that worked fine on my DVD player which to be honest is a fairly average DVD player. I would recommend using a DVD-RW just so that you can erase and re-burn your DVD using different write speeds and see if this improves quality. It could well be worth doing. Shown in the picture below is the burn disc options menu. It is here you select the disk drive your blank DVD disk is contained. Also you can give your disk a name e.g. Holiday Footage and also adjust the disk writing speed. The default settings resulted in a DVD that worked fine on my DVD player which to be honest is a fairly average DVD player. I would recommend using a DVD-RW just so that you can erase and re-burn your DVD using different write speeds and see if this improves quality. It could well be worth doing. Awesome Post great sharing nice.